While lens fragments may be retained in the anterior or posterior chamber during seemingly uncomplicated cataract surgery, they also may be dislocated posteriorly into the vitreous cavity during phacoemulsification of the nucleus, usually after zonular dehiscence or posterior capsule rupture. Lens-induced uveitis may develop, and the degree of intraocular inflammation in these patients often is governed by the size of the retained lens fragment, the time since cataract surgery, the patient's individual inflammatory response, and the extent of other intraocular manipulations. Lens proteins are most likely immunologically privileged, and they may initiate an immunologic sensitization only after entering the aqueous humor. This privilege is probably because of numerous factors, as follows: lens proteins are isolated from the fetal circulation early in embryonic life, the lens is devoid of innervation, and the adult lens is completely avascular. However, the immunopathogenesis of lens-induced uveitis is not precisely understood. The lens is an epithelial structure as it is derived from primitive ectoderm. By virtue of its capacity to synthesize alpha crystallins, the lens epithelium may become strongly antigenic. [12, 13, 14, 15, 16, 17, 18, 19] The protein concentration within the lens is higher than that of any other tissue in the body. Early experiments inferred that lens antigens are shared among a number of animal species, and they can provoke the formation of homologous antibodies. [16, 20] Halbert et al found that lens proteins might be autoantigenic when they escape from their position of immunological isolation in the lens capsule. Each of the crystallin protein groups of lens cortical fibers contains a number of subtypes with distinct antigenic characteristics. Autologous lens proteins are only weakly antigenic, but fractionated crystallins are much more effective in stimulating an antibody response. The conversion process from soluble crystallins to insoluble proteins during aging of the lens also may result in an increased antigenic effect of proteins from mature or hypermature cataracts. 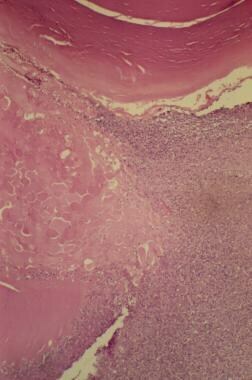 The classic histologic picture is one of zonal granulomatous inflammation. [22, 12, 21, 23, 24] Polymorphonuclear leukocyte infiltration around degenerate lens remnants is surrounded by a palisade of macrophages, including epithelioid cells and multinucleated giant cells (see the images below). 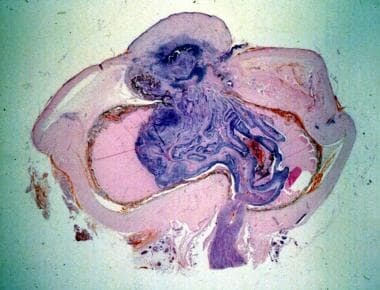 Gross photomicrograph for eye enucleated with penetrating injury. 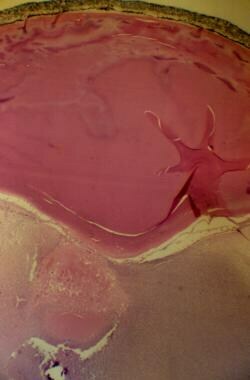 Gross photomicrograph for eye enucleated with penetrating injury. Note marked inflammatory reaction consisting of polymorphonuclear cells around lens capsule and lens fibers (hematoxylin and eosin X100). Low (X25) photomicrograph of phacoanaphylactic reaction to lens protein in eye enucleated with penetrating injury. Note polymorphonuclear leucocytes around lens protein (hematoxylin and eosin). Eosinophils may be prominent, and, eventually, fibroblastic granulation tissue develops together with prominent lymphocyte and plasma cell infiltration. The uveitis principally affects the iris, with the choroid being only secondarily involved. 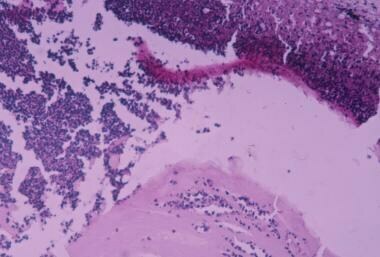 Retinal perivasculitis and papillitis may develop because of the presence of cross-reacting antigens in these tissues. Although a zonal granulomatous inflammation is the classic histopathologic description, a nongranulomatous uveitis also has been observed (see the image below). High (X50) photomicrograph of phacoanaphylactic reaction to lens protein in eye enucleated with penetrating injury. Note polymorphonuclear leucocytes around lens protein (hematoxylin and eosin). The term phacoanaphylaxis is probably inappropriate because no evidence exists of a classic type I immunoglobulin E (IgE) mediated anaphylactic reaction. The immunopathogenesis of lens-induced uveitis is believed to be the result of autosensitization to lens proteins. After a break in the lens capsule and sensitization to lens proteins, an immune complex–mediated phenomenon develops, which can be transferred by hyperimmune serum. Type II, III, and IV hypersensitivity reactions may be involved in the pathogenesis. The disease most likely is induced by altered tolerance to lens protein and not as a result of a rejection phenomenon of sequestered foreign materials. The specific type of immunological reaction in lens-induced uveitis may vary from patient to patient, and it may depend on the type of surgery or injury, the amount of retained lens in the vitreous cavity, and the previous immunological status of both the patient and the eye. The incidence of both phacoanaphylaxis and lens-induced uveitis is unknown. The best estimate of the incidence of posteriorly displaced lens fragments during phacoemulsification is 0.3-18% (the latter figure reported by a surgeon learning to use phacoemulsification). The incidence of retained lens fragments has increased as phacoemulsification has become more popular for cataract surgery. Although data are lacking, the authors' clinical impression is that about 50% of patients with retained lens material after cataract surgery have lens-induced uveitis. The incidence of lens-induced uveitis following penetrating injury is unknown. Lens-induced uveitis may cause or may be associated with cystoid macular edema, hypotony, phthisis, and secondary glaucoma. [25, 26, 27, 28] Complications also may be the result of medical or surgical treatment of lens-induced uveitis. Phacoanaphylactic endophthalmitis and lens-induced uveitis are more common in the elderly population, with a peak incidence in the sixth to seventh decades. The main exception is traumatic cataract and related complications, which are more common in younger age groups. Brinkman CJ, Broekhuyse RM. Cell mediated immunity in relation to cataract and cataract surgery. Br J Ophthalmol. 1979 May. 63(5):301-5. [Medline]. Luntz MH, Wright R. Lens-induced uveitis. Exp Eye Res. 1962. 1:317-323. Zimmerman LE. Lens induced inflammation in human eyes. Maumenee AE, Silverstein AM, eds. Immunopathology of Uveitis. Lippincott Williams & Wilkins; 1964. 221-232. Verhoeff FH, Lemoine AN. Endophthalmitis phacoanaphylactica. Am J Ophthalmol. 1922. 5:737-745. Apple DJ, Mamalis N, Steinmetz RL, Loftfield K, Crandall AS, Olson RJ. Phacoanaphylactic endophthalmitis associated with extracapsular cataract extraction and posterior chamber intraocular lens. Arch Ophthalmol. 1984 Oct. 102(10):1528-32. [Medline]. Blodi BA, Flynn HW Jr, Blodi CF, Folk JC, Daily MJ. Retained nuclei after cataract surgery. Ophthalmology. 1992 Jan. 99(1):41-4. [Medline]. Fine HI. Small incision cataract surgery. Yanoff M, Duker JS. Ophthalmology. 1st ed. Mosby Inc; 1999. 23.1-10. Gifford SR. Allergic and toxic properties of lens protein. JAMA. 1925. 85:351-356. Goodner EK. Experimental lens-induced uveitis in rabbits. Maumenee AE, Silverstein AM, ed. Immunopathology of Uveitis. Lippincott Williams & Wilkins; 1964. 233-242. Hektoen L, Schulhof K. Further observations on lens precipitins. Antigenic properties of alpha and beta crystallins. J Infect Dis. 1924. 34:433-439. Little J, Langman J. Lens antigens in the intraocular tissues of the human eye. Arch Ophthal. 1964. 72:820-825. Mehta PD, Cooper SN, Rao SS. Identification of species -specific and organ-specific antigens in lens proteins. Exp Eye Res. 1964. 3:192-199. Kida H. Experimental endophthalmitis phacoanaphylactica in rabbits sensitized with the purified bovine alpha-crystallin. Folia Ophthalmol Jpn. 1961. 12:304-311. Rahi AH, Garner A. Immunopathology of the Eye. Oxford, England: Blackwell Scientific Publications; 1976. Woods AC. An adventure in ophthalmic literature: Manuel Straub and the tradition of toxicity in lens protein. Am J Ophthalmol. 1959. 48:463-472. Maisel H, Goodman M. Analysis of mammalian lens proteins by electrophoresis. Arch Ophthal. 1964. 71:671-675. Halbert SP, Manski W. Biological aspects of autoimmune reactions in the lens. Invest Ophthal. 1965. 4:516-530. Friedlander MH. Allergy and Immunology of the Eye. Lippincott-Raven Publishers; 1979. 24-203. Kincses E, Szabo G. Human and cellular immune response after injury of the lens . Ocular Immune Responses: Proceedings of the International Symposium on Immunology & Immunopathology of the Eye. Strasbourg: S Karger AG Basel Publisher; 1974. 16. Marak GE Jr. Phacoanaphylactic endophthalmitis. Surv Ophthalmol. 1992 Mar-Apr. 36(5):325-39. [Medline]. Gass JD, Norton EW. Follow-up study of cystoid macular edema following cataract extraction. Trans Am Acad Ophthalmol Otolaryngol. 1969 Jul-Aug. 73(4):665-82. [Medline]. Toris CB, Pederson JE. Aqueous humor dynamics in experimental iridocyclitis. Invest Ophthalmol Vis Sci. 1987 Mar. 28(3):477-81. [Medline]. Thach AB, Marak GE Jr, McLean IW, Green WR. Phacoanaphylactic endophthalmitis: a clinicopathologic review. Int Ophthalmol. 1991 Jul. 15(4):271-9. [Medline]. Besen G, Freeman WR. Intraoperative recognition of retinal vasculitis in a patient with early lens-induced uveitis. Ophthalmic Surg Lasers. 1997 Jan. 28(1):67-8. [Medline]. Chishti M, Henkind P. Spontaneous rupture of anterior lens capsule (phacoanaphylactic endophthalmitis). Am J Ophthalmol. 1970 Feb. 69(2):264-70. [Medline]. Perlman EM, Albert DM. Clinically unsuspected phacoanaphylaxis after ocular trauma. Arch Ophthalmol. 1977 Feb. 95(2):244-6. [Medline]. Habil I, Cohen E, Karshai I, BenEzra D, Behar-Cohen F. Spontaneous involution of autologous lenses and phacoanaphylaxis reaction in Stickler syndrome. Br J Ophthalmol. 2005 Nov. 89(11):1532-3. [Medline]. Inomata H, Yoshikawa H, Rao NA. Phacoanaphylaxis in Behçet's disease: a clinicopathologic and immunohistochemical study. Ophthalmology. 2003 Oct. 110(10):1942-5. [Medline]. McCluskey P, Harrisberg B. Long-term results using scleral-fixated posterior chamber intraocular lenses. J Cataract Refract Surg. 1994 Jan. 20(1):34-9. [Medline]. McMahon MS, Weiss JS, Riedel KG. Clinically unsuspected phacoanaphylaxis after extracapsular cataract extraction with intraocular lens implantation. Br J Ophthalmol. 1985 Nov. 69(11):836-40. [Medline]. Muccioli C, Belfort R Jr. Cataract surgery in patients with uveitis. Int Ophthalmol Clin. 2000 Spring. 40(2):163-73. [Medline]. Truhlsen SM. Approaching nucleus slippage. Arch Ophthalmol. 1991 May. 109(5):627. [Medline]. Ritch R. Exfoliation syndrome and exfoliative glaucoma. Eid TM, Spaeth GL. Glaucomas: Concepts and Fundamentals. Lippincott Williams & Wilkins: 2000. 114-120. Winward KE, Pflugfelder SC, Flynn HW Jr, Roussel TJ, Davis JL. Postoperative Propionibacterium endophthalmitis. Treatment strategies and long-term results. Ophthalmology. 1993 Apr. 100(4):447-51. [Medline]. Speaker MG, Smolin G, Menikoff JA, Friedlaender MH, eds. Postoperative endophthalmitis: Pathogenesis, prophylaxis and management. International Ophthalmology Clinics. 1993. Vol 33.: 51-70. Kraff MC, Sanders DR, Lieberman HL, Peyman GA, Levine RA. Membrane formation after implantation of polyvinyl alcohol-coated intraocular lenses. J Am Intraocul Implant Soc. 1980 Apr. 6(2):129-36. [Medline]. Stark WJ, Rosenblum P, Maumenee AE, Cowan CL. Postoperative inflammatory reactions to intraocular lense sterilized with ethylene-oxide. Ophthalmology. 1980 May. 87(5):385-9. [Medline]. Allen JC. Sympathetic uveitis and phacoanaphylaxis. Am J Ophthalmol. 1967 Feb. 63(2):280-3. [Medline]. Blodi FC. Sympathetic uveitis as an allergic phenomenon: with a study in association with phacoanaphylactic uveitis and a report on the pathological findings in sympathizing eyes. Trans Am Acad Ophthal Otolaryng. 1959. 63:642-649. Chan CC. Relationship between sympathetic ophthalmia, phacoanaphylatic endophthalmitis, and Vogt-Koyanagi-Harada disease. Ophthalmology. 1988 May. 95(5):619-24. [Medline]. Sheppard JD. Seminars in Ophthalmology. Beatty RL, ed. Sympathetic Ophthalmia. Philadelphia: JB Lippincott; 1994. Ishikawa Y, Kawata K. Three cases of endophthalmitis phacoanaphylactica in the fellow eye after extracapsular lens extraction. Folia Ophthalmol Jpn. 1977. 28:1260-1265. Lubin JR, Albert DM, Weinstein M. Sixty-five years of sympathetic ophthalmia. A clinicopathologic review of 105 cases (1913--1978). Ophthalmology. 1980 Feb. 87(2):109-21. [Medline]. Sisk RA, Davis JL, Dubovy SR, Smiddy WE. Sympathetic ophthalmia following vitrectomy for endophthalmitis after intravitreal bevacizumab. Ocul Immunol Inflamm. 2008 Sep-Oct. 16(5):236-8. [Medline]. Easom H, Zimmerman LE. Sympathetic ophthalmia and bilateral phacoanaphylaxis. A clinicopathologic correlation of the sympathogenic and sympathizing eyes. Arch Ophthalmol. 1964 Jul. 72:9-15. [Medline]. Easom HA, Zimmerman LE. Sympathetic ophthalmia and bilateral phacoanaphylaxis. A clinicopathological correlation of the sympathogenic and sympathizing eyes. Arch Ophthalmol. 1964. 72:9-15. Croxatto JO, Rao NA, McLean IW, Marak GE. Atypical histopathologic features in sympathetic ophthalmia. A study of a hundred cases. Int Ophthalmol. 1982 Feb. 4(3):129-35. [Medline]. Muller H. Phacolytic glaucoma and phacogenic ophthalmia (lens-induced uveitis). Trans Ophthal. Soc. UK. 1963. 83:689-704. Fisher D. Glaucoma associated with uveitis (Inflammatory glaucoma). Eid TM, Spaeth GL. The Glaucomas: Concepts and Fundamentals. Lippincott Williams & Wilkins; 2000. 190-198. Irvine SR, Irvine AR Jr. Lens-induced uveitis and glaucoma: Endophthalmitis phacoanaphylactica. Am J Ophthalmol. 1952. 35:177. Alward WL, Byrne SF, Hughes JR, Hodapp EA. Dislocated lens nuclei simulating choroidal melanomas. Arch Ophthalmol. 1989 Oct. 107(10):1463-4. [Medline]. Pavlin CJ, Harasiewicz K, Sherar MD, Foster FS. Clinical use of ultrasound biomicroscopy. Ophthalmology. 1991 Mar. 98(3):287-95. [Medline]. Sampaolesi R. Three-dimensional scan using a single transducer and image construction. Tomita M, Sugata Y, Yamamoto Y, eds. Ultrasonography in Ophthalmology 12, Documenta Ophthalmologica Proceedings. Kluwer Academic Publishers; 1990. 455-460. Fastenberg DM, Schwartz PL, Shakin JL, Golub BM. Management of dislocated nuclear fragments after phacoemulsification. Am J Ophthalmol. 1991 Nov 15. 112(5):535-9. [Medline]. Kim JE, Flynn HW Jr, Smiddy WE, et al. Retained lens fragments after phacoemulsification. Ophthalmology. 1994 Nov. 101(11):1827-32. [Medline]. Lambrou FH Jr, Stewart MW. Management of dislocated lens fragments during phacoemulsification. Ophthalmology. 1992 Aug. 99(8):1260-2; discussion 1268-9. [Medline]. Smiddy WE, Flynn HW. Management of retained lens fragments and dislocated posterior chamber intraocular lenses. In: Albert DM, Jakobiec FA. Principles and Practice of Ophthalmology. WB Saunders Co. 2000:2485-2494. Stewart MW. Managing retained lens fragments: raising the bar. Am J Ophthalmol. 2009 Apr. 147(4):569-70. [Medline]. Ho LY, Doft BH, Wang L, Bunker CH. Clinical predictors and outcomes of pars plana vitrectomy for retained lens material after cataract extraction. Am J Ophthalmol. 2009 Apr. 147(4):587-594.e1. [Medline]. Endophthalmitis Vitrectomy Study Group. Results of the Endophthalmitis Vitrectomy Study. A randomized trial of immediate vitrectomy and of intravenous antibiotics for the treatment of postoperative bacterial endophthalmitis. Endophthalmitis Vitrectomy Study Group. Arch Ophthalmol. 1995 Dec. 113(12):1479-96. [Medline]. Greve MD, Peyman GA, Mehta NJ, Millsap CM. Use of perfluoroperhydrophenanthrene in the management of posteriorly dislocated crystalline and intraocular lenses. Ophthalmic Surg. 1993 Sep. 24(9):593-7. [Medline]. Borne MJ, Tasman W, Regillo C, Malecha M, Sarin L. Outcomes of vitrectomy for retained lens fragments. Ophthalmology. 1996 Jun. 103(6):971-6. [Medline]. Schechter RJ. Glass-slide vitrectomy for use by the cataract surgeon. Am J Ophthalmol. 1991 Jul 15. 112(1):100. [Medline]. Weinstein GW, Charlton JF, Esmer E. The "lost lens": a new surgical technique using the Machemer lens. Ophthalmic Surg. 1995 Mar-Apr. 26(2):156-9. [Medline]. Vilar NF, Flynn HW Jr, Smiddy WE, Murray TG, Davis JL, Rubsamen PE. Removal of retained lens fragments after phacoemulsification reverses secondary glaucoma and restores visual acuity. Ophthalmology. 1997 May. 104(5):787-91; discussion 791-2. [Medline]. Jaffe NS. Cataract Surgery & Its Complications. St. Louis: Mosby Inc; 1976. 367-370. Burky EL, Woods AC. Lens extract: its preparation and clinical use. Arch Ophthalmol. 1931. 6:548-553. Epstein E. Suture problems. J Cataract Refract Surg. 1989 Jan. 15(1):116. [Medline]. Kronenthal RL. Nylon in the anterior chamber. Ophthalmology. 1981 Sep. 88(9):965-7. [Medline]. Leaming DV. Practice styles and preferences of ASCRS members--1994 survey. J Cataract Refract Surg. 1995 Jul. 21(4):378-85. [Medline]. Uhlenhuth P. Zur Lehre von der Unterscheidung verschiedener Eiweissarten mit Hilfe spezifischer Sera. In: Festschrift zum Geburstag Robert Koch. Gustav Fischer Verlag. 1903:49-74. Volcker HE, Naumann GO. Morphology of uveal and retinal edemas in acute and persisting hypotony. Mod Probl Ophthalmol. 1979. 20:34-41. [Medline]. Phacoanaphylactic reaction to penetrating injury of lens. This patient was a 25-year-old woman whose eye was penetrated with a 27-gauge needle during an attempt to anesthetize the eyelid for chalazion removal. One week later, a marked uveitis was present. Notice perforation site and posterior synechiae. Same patient as in Media file 5. Notice cortical cataract at perforation site. Typical clinical picture of retained lens material following cataract surgery. White cortical material is easily visible in the pupillary space. Patient with persistently elevated intraocular pressure after cataract surgery was found to have retained lens material and low-grade inflammation. Eye is white and quiet with anterior chamber lens. Patient with persistently elevated intraocular pressure after cataract surgery was found to have retained lens material and low-grade inflammation. Retained lens material is visible in retroillumination on downgaze. Typical appearance of retained lens fragments in posterior vitreous cavity. Lens material is a whitish substance that obscures fundus details. Another view of a retained lens fragment, noted inferiorly.